Ready to play a Frogger game? 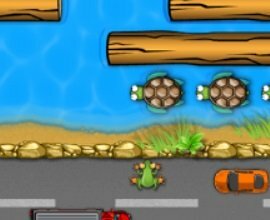 This version, Jumper Frog, is very similar to the classic Frogger arcade game. Enjoy! To begin, click the Small, Medium, or Large link under the picture at left. This opens the game in a pop-up window. Note: This is an HTML5 game. It does not require the Adobe Flash Player. The game should run easily in any modern browser. Games like Jumper Frog train important brain skills like attention, concentration, and reaction time. Use the Arrow Keys to move your frog around the screen. If you like this game, you might also enjoy the other free HTML5 games on this site. HOW TO PLAY. As in the arcade version of Frogger, the object of this game is to move your frogs from the bottom of the screen to the safety of the coves at the top of the screen. Start the game by clicking the PLAY button on the home screen. If you wish, you can mute the game sound by clicking the speaker icon in the upper right corner of the game. After you click the PLAY button, a summary of the rules displays. Click on the rules to close them and begin playing. Similar to the Frogger arcade version, to play this frogger game you first need to jump your frog past several lanes of vehicle traffic without being run over. Do this by jumping carefully to avoid the cars and trucks on the road. Using the Arrow Keys, you can jump forward, backward, right, or left on the screen. After crossing the road, your frog next has to navigate across a raging river without drowning. Cross the river by hopping on the backs of swimming turtles and floating logs. Beware! Sometimes the turtles submerge. Make sure your frog is not on the back of a turtle when the turtle submerges. Finally, jump into one of the unoccupied coves. Be sure to line up your frog carefully so your frog lands in the cove slot and doesn't hit the forest wall instead. Bonus: Sometimes a fly (the insect) may land in an unoccupied cove. Jump your frog onto the fly to catch him for bonus points. You start the game with 5 lives. 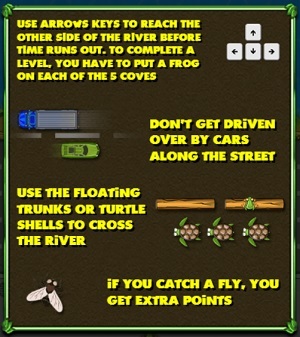 To finish each level, place a frog in each of the five coves before the timer runs out. When you play a frogger game like Jumper Frog, you're accomplishing more than just having fun. Concentration games like this one help sharpen specific brain skills related to attention and mental reaction time. Play these games often to give your brain a boost!